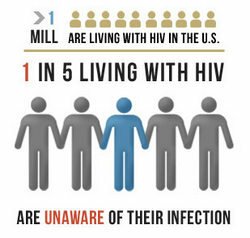 HIV cannot be cured – except for when it is. That was the paradox that ended an afternoon of events on Monday, December 2, in which Northwestern Medicine® community members commemorated the 25th anniversary of World AIDS Day, a global event to support and commemorate those living with the disease. The sentiment came as part of an announcement regarding Timothy Ray Brown, the first person in the world cured of HIV, coming to campus this spring to take part in a series of events. Brown no longer tested positive for the virus following a stem cell transplant to treat cancer seven years ago. Since that time, several others, including a Memphis-born baby this year, have been diagnosed with HIV and later deemed “cured.” Still, no full-proof cure for the disease exists, and scientists continue to study these cases. Research technician Z. Kelley, right, discusses his research on the series of coordinated events that must take place for HIV to infect a cell. Kelley, a member of Thomas Hope’s lab, was presenting the project during the medical school’s World AIDS Day commemoration. Attended by students, fellows, faculty and guests, Northwestern University Feinberg School of Medicine’s annual AIDS Day featured two panel discussions, a scientific poster session and a networking reception. D’Aquila, professor in Medicine-Infectious Diseases, began the mini-symposium by moderating the first discussion. He is one of several scientists at the medical school working to discover how HIV might be controlled. Z. Kelley, a research technician in the lab of Thomas Hope, PhD, professor of Cell and Molecular Biology, was one of more than two dozen poster presenters. His work focuses on the series of coordinated events that must take place in order for the virus to infect a cell. Robert Murphy, MD, director of the Center for Global Health and John P. Phair Professor of Infectious Diseases, and Babafemi Taiwo, MBBS, associate professor of Medicine-Infectious Diseases, both of whom recently received grants to conduct HIV research in Africa, joined D’Aquila and Brian Mustanski, PhD, associate professor in Medical Social Sciences and Psychiatry and Behavioral Sciences, during the second panel discussion. “By having these sessions at the same time every year we hope to spark research interest and build upon collaborations that will start here and end with a cure for AIDS,” D’Aquila said. This was the fourth year that the Student Advisory Committee for Global Health sponsored the events at Feinberg.